These cats are mad cats and their bikes are wild. As ever, the Japanese win hands down when it comes to Over The Topness - this time with the Dekochari fad. 'Deko-' meaning 'Decorate' and '-Chari' meaning slang for bike. 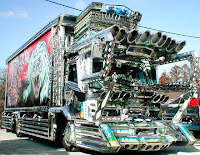 It's a follow-on from the cultural phenomenon of decorating trucks - dekoTORA. Something you see all over the world but again, OTT in Japan. 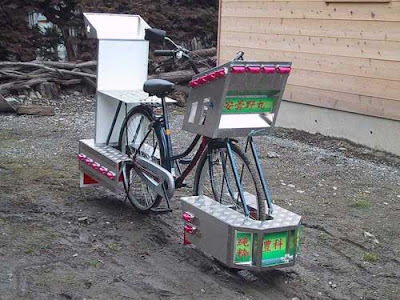 Dekochari involves pimping your bike to the max. To the extreme. To a place far beyond rational thinking. Lights, bumpers, stereos, more lights. The way the Japanese embrace fads is amazing and charming and not a little spooky. It's only fitting that it is in one of the world's great bicycle cultures that the dekochari culture blossoms. In another Asia-related piece, fellow bike-blogger Qian, in Australia, has a humourous comparison between the Sentai [Power Rangers] characters and many cyclists. Here's the link to his post on Fahrradsozialismus. Nothing to do with bikes, but here's the phone call where Sarah Palin got pranked into thinking she was talking to French President Nicolas Sarkozy. Too funny.